Wanted to take a brief moment and update everyone on the turf project. Even though the turf is finished, several projects related to the larger project are still in progress. Thanks to Rod Dilyard for the picture at the top. Click here for a full-size version. Also wanted to share some updated photos as well as info relating to the cut-off date for fundraising. We're less than 2 weeks away from opening night at the newly christened Serpentini Field at Red Rider Stadium and everyone from players, coaches, alumni, administrators and the community as a whole are starting to buzz about this night. Below you'll find quick updates on various projects at the stadium...some are related to the turf project, and some are just general improvements that were due (or overdue). As mentioned earlier, the turf is 100% done and teams have begun practicing on the field. The football team has had several practices and a scrimmage on the field while the soccer program had their first scrimmage on the field this past Thursday. The band has also been using the field. They would have gotten on the field earlier, but their band camp last week was held during the day, the same time the crew from VASCO was applying layers to the track, preventing the band from using the field. Some have asked about the "order" of use of the field, and it basically breaks down like this. One, high school sports have precedence over middle school sports. Two, in-season sports have precedence over out-of-season sports. Three, games have precedence over practice. Lastly, school events will take precedence over community events (Boys & Girls Club games, etc.) That's the gist of it. I think all levels of football (7th, 8th, freshman & JV) will have all home games on the turf except for two 7th grade games that will conflict with varsity soccer games. The first contest on the turf will be the JV Football game versus Northwest on August 25th. The first varsity game will be on August 31st and the first JV/Varsity soccer game will be on September 4th. 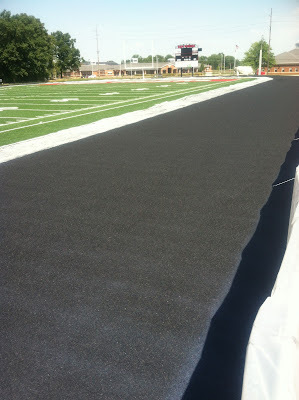 The track resurfacing (not part of the turf project) is nearly complete. The final layer of the latex/rubber application was completed on Monday the 13th and just this past Friday, the lane markings were added. Work was done by VASCO Sports Contractors out of Massillon...and the track looks awesome. The wrap, being installed by Gameday Renovations out of Massillon is partially done and will be finished up in the next few days weather permitting. This project is part of the turf project as it was a way to spruce up the back side of the home bleachers as well as a space to give the naming rights sponsor, Serpentini Chevy, some good visibility. The fence work is being done by Mt. Hope Fence and will probably be in progress for another week or so given good weather. It's black chain link fence and when done will secure the stadium and also look great. The old fencing was rusted and fairly worn out so it's great to see that improved. All that remains is to install the gates at various points around the stadium. 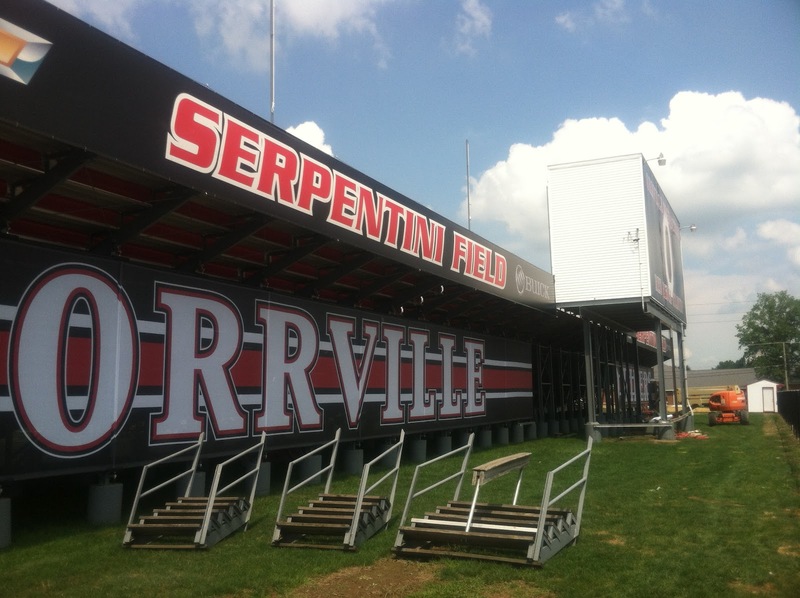 Serpentini Chevrolet has the field naming rights, but naming rights were also extended to the home concession stand, goalposts & also the ticket booths. Those have been secured by White's Maibach Ford (home concession stand) and Hummel Group (ticket booths). Both will have business signs above each structure recognizing their gift. Aultman Orrville Hospital has also purchased the naming rights to the goalposts. You'll notice on the padding at the base of each goal post is the Aultman logo and wordmark. Pictured above is White's Maibach General Manager Brian Gibson along with Orrville Superintendent Jon Ritchie and turf committee co-chairs Mark Zook and Mike Jarrett presenting White's Maibach's donation to the project. All totaled, these three companies have donated nearly $70,000 towards the project so it's quite a contribution by all three. Some other smaller, but just as important projects are finishing up at the stadium and most deal with some overdue painting (not part of the turf project). The bathrooms got a new coat of paint, as well as the concession stands, the ticket booths and the storage barns on the home side beside the concession stands. As part of the track project, VASCO also sealcoated the asphalt walkway near the concession stands and also the walkways near the restrooms. Also, the men's restroom no longer has the trough...but now has separate urinals. They're waterless, which I'm not sure how that works, but it was less expensive, and didn't require a code update. As of Monday August 13th, fundraising was nearing the $675,000 mark. Donors wishing to have their name included on the permanent plaque being installed near the south end ticket booth will need to donate prior to September 7th. Active fundraising will end on that date and work will begin on the permanent sign recognizing all donors. 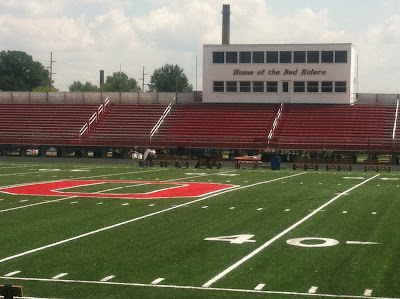 We're now above 250 business & individual donors and a listing of donors, current as of 8/15/12 can be viewed at the top of this page, or at RedRiderTurf.com (scroll to the bottom of that page). The current total is enough to pay for everything and have around $25,000-$30,000 left over. That remainder will be put into a contingency fund to replace the turf in 10-15 years. That contingency fund, along with new naming rights money in 10 years will go a long way to assuring that the turf can be replaced once it reaches the end of it's useful life without becoming a financial burden to the school district. Typical replacement costs of turf run about half of the original installation, but factoring in the increase in the cost of materials and inflation, that replacement cost could still run upwards of $300,000. A special recognition ceremony will take place prior to the kickoff of the Orrville-Triway game to recognize business donors and to thank the Orrville community in general. It's just so amazing that this project happened...and happened so quickly. As late as May, the committee thought that it might not happen until the summer of 2013. But as always, the Orrville community stepped up. I love hearing how other schools in the OCC and the Wayne County area expressed doubt that we'd be able to make this happen in such a short time frame. I guess the proof is in the pudding. That's Red Rider Tradition in a nutshell...other schools may talk about things...we put egos and agendas aside go out and do it.